Insurance education with AssociatePI. Helping you earn your CPCU®, API™, AND ARM™ insurance designations. Study with less stress. With an online course that simplifies the difficulttopics, helping you easily navigate the overwhelming content to comprehend the complex concepts. WHO IS ASSSOCIATEPI AND WHY SHOULD I TRUST YOU? I’m Jake. I’m the founder of AssociatePI. I was unhappy with the traditional study material available for the CPCU® exams so I set out and created my own. I gathered a group of CPCU® designees that I’ve met over the years from working in the insurance industry and attending CPCU® events. Together, we developed our proprietary online courses that actually prepare you for the exam and help you remember what you’ve studied. At AssociatePI, we believe continuous learning should be pursued by all individuals of the insurance industry. Our goal is to provide you with the best study material possible for you to better grasp a full understanding of all personal insurance subjects to help you complete The Institutes’ Associate in Personal Insurance Designation (API™) and Chartered Property Casualty Underwriter Designation (CPCU®). AssociatePI’s mission is to deliver the best in quality personal insurance training material at a competitive price in order to develop a continuous learning and advancing insurance environment. Our expectation is to be a leader in personal insurance education as we look to continuously develop insurance professionals in order to provide insurance customers with the most experienced and developed professionals which are exemplary in representing their employer and the insurance industry as a whole. AssociatePI was founded by myself, Jake Lang, in 2014. The company started as a side project while I was studying for the CPCU® with a few associates. It all started because I was not satisfied with the textbooks, finding that there was way too much fluff content and the practice exams were very poorly constructed and did not help to prepare me for the type of questions that were actually on the exam. At the time, I did not intend to create a company. I was simply providing practice exams and notes for free online and helping other CPCU® students by publishing exam reviews based on my personal experiences; but that quickly snowballed into something bigger. I personally took on the project to bring AssociatePI large scale and we’ve now been in business selling our courses and publishing new content since 2014, growing along the way and now having personally helped over 5,000 students pass their CPCU® exams. This course is entirely online and self-study. Study at your own pace and navigate through our series of text-based modules, quizzes, and practice exams. The online course is mobile compatible and hosted on AssociatePI’s website. You will be prompted to create an account, your account will sync with your online course. To access your course, log in to AssociatePI with your username and password. WHAT’S SO SPECIAL ABOUT YOUR COURSES? The major benefit of our online course is that each section and question was handcrafted by a CPCU® expert that has passed their exams, meaning we know exactly which topics are important and how the questions are formatted. By replicating the questions as closely as possible to the actual exam, we give our course and practice exams a “real exam” feel, helping our students better prepare for their exam. WHAT IS THE BENEFIT OF YOUR ONLINE COURSE? Easy to read. Easy to comprehend – We write our online courses to simplify the studying process, conveying the topics in simple terms and plain English. We make it easy to read, comprehend, and consume the abundance of complex content. Fully prepared to pass – No more struggling to recall information when taking your exam, no more forgetting the minor details, and no more uneasy feelings of unpreparedness when you sit for the exam. Easily master the minor details and memorize the exam concepts with the online course that has helped thousands pass with a 99% pass rate. Pass your exam (99% pass rate) – Thousands have used the AssociatePI program to pass their exams, with a 99% exam pass rate (compared to the industry average 70% pass rate). Study faster (pass in just two weeks) – You no longer need to study for 8 weeks to pass your exam (the industry recommended study time). With our streamlined online course, students pass their exams, on average, in 2 weeks by studying just 1 hour per day. 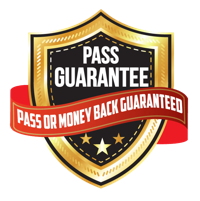 Money Back Guarantee – Pass your exam with our Comprehensive Course or your full money back, guaranteed. Mobile. Printable – Your online course is completely online, mobile compatible, printable, and available as an app. Suitable for any studying style. WHAT’S INCLUDED IN YOUR COMPREHENSIVE ONLINE COURSE? Our Comprehensive Online Course is a complete course covering all of the content on the exam. The course is designed by CPCUs to cut out the fluff material; summarizing and organizing the material in an easy to read and comprehend format allowing you to pass your exam with less studying. In addition to the course content, the Comprehensive Course includes over 350 practice questions, including two 85 question practice exams, divided up by topic allowing you to take a quiz for each topic of each chapter and a fill in the blank study guide ensuring you take notes on the most important topics. The course is specifically designed to help you master the vast amount of content. We do this by explaining each concept in plain English along with recap questions to test your understanding of each topic. WHAT’S INCLUDED IN YOUR PRACTICE EXAM COURSE? WHAT IS THE SUCCESS RATE OF YOUR COURSE? Almost 100%…Thousands have used the AssociatePI program to pass their exams, with a 99% exam pass rate (compared to the industry average 70% pass rate). Our online courses, practice exams, and resources have been used by thousands of personal and commercial insurance employees. We’ve personally helped thousands complete their CPCU® designation and most even come back to help us improve our courses after they pass! We offer a money back guarantee. If you don’t pass your exam with our Comprehensive Online Course (the full course) we will issue a full refund for the cost of your course. You can see the requirements for the money back guarantee here. Please note, we do not offer a guarantee for our practice exam courses. This guarantee is for the Comprehensive Course only. DO I NEED TO PURCHASE THE TEXTBOOKS OR ANY OTHER STUDY MATERIAL WITH YOUR COURSE? HOW LONG WILL I REMAIN ENROLLED IN THE COURSE? You will be granted lifetime enrollment upon the purchase of your course. We like to leave all of our courses open for life just in case you want to come back to review a topic in the future. THE EXAM IS CHANGING. DO I NEED TO BUY A NEW COURSE? Nope! Our courses are automatically updated, at no cost to the user, each time the exam content changes. Whenever the exam changes we update our online course (during the downtime so it doesn’t disrupt studying) to reflect the new content. No need to buy a new course, your online course will always reflect the most up to date exam content. WHY IS THIS COURSE ONLY FIVE OR SIX CHAPTERS? Our courses are proprietary courses written by AssociatePI. While the courses do cover all of the same content that will be on the exam, and the same content as other study material providers, we organize our course in a slightly different order. This is done intentionally to improve the ease of studying and comprehension. This is why you will notice some of our courses are only five or six chapters, whereas other study material providers often offer eight to ten chapters. We cover the same content, the only difference is we arrange the topics and summarize the content into fewer chapters for ease of user experience and comprehension. Simply click here and find your course, then click “Enroll Now” and checkout. You will need to sign in or create an account. After you register and pay you will be automatically enrolled in the course. You can access the course immediately to get started studying. QUESTION NOT ANSWERED? CONTACT US.